Self Portrait, 1906, oil on canvas, 70 x 53 cm, Uffizi Gallery, Florence. John Singer Sargent (January 12, 1856 – April 14, 1925) was a renowned turn-of-the century portrait painter, as well as a gifted landscape painter, watercolorist, and muralist. His prodigious career has become a testament to a bygone era - a slower and gentler time that was soon to be consumed by the tumultuous changes of the twentieth century. Madame X, 1884, oil on canvas, 234.95 x 109.86 cm, Metropolitan Museum of Art, Manhattan. John Singer Sargent was born in Florence, Italy in 1856 to American parents but lived most of his life in Great Britain. He was the first child of Dr. Fitzwilliam Sargent, a surgeon from an old New England family, and Mary Newbold Singer, the daughter of a Philadelphia merchant. Sargent received his earliest formal instruction in Rome in 1869, where he was taught by the German-American landscape painter Carl Welsch. From 1873-1874 he attended the Accademia di Belle Arti in Florence. Like many artists in pursuit of their craft, Sargent traveled extensively. Additionally, he would spend the latter part of his life visiting the United States and painting his epic mural for the Boston Public Library. In his youth he was educated in Italy, France and Germany, and finally moving to Paris in 1874, he studied under Emile Auguste Carolus-Duran whose influence would be pivotal during his early years. In 1879 he traveled to Madrid, Spain to study the works of Diego Velázquez, and to The Netherlands, to view the works of Frans Hals. He lived a total of ten years in Paris until scandal broke out over his controversial painting, Madame X. Critics have compared Sargent to Velázquez, who he greatly admired, and his painting The Daughters of Edward Darley Boit, 1882, is said to emulate Velázquez' Las Meninas. 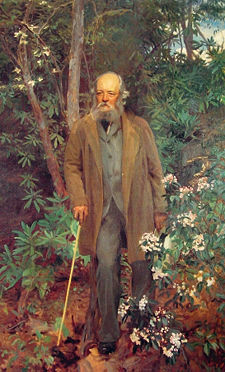 Frederick Law Olmsted, 1895, oil on canvas, 91 x 61 1/4 in. 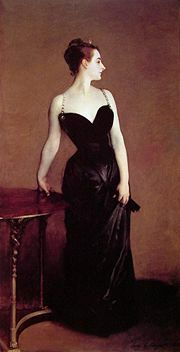 However, Sargent's Portrait of Madame X ignited controversy after its unveiling at the Paris Salon in 1884. At the time it aroused such a negative reaction that it prompted Sargent to move to London. Eventually the painting was sold to the Metropolitan Museum of Art and today it is considered one of Sargent's best works. It was also one of the artist's favorite. Sargent's best portraits were said to have revealed the individuality and personality of the sitter. Thomas Craven in A Treasury of Art Masterpieces (470) says, "His rightness in proportions was microscopically unerring - he never missed a dimension, or varied a hairsbreadth from the exact size and just relationships of features; he was a dead shot at likenesses." Mr. and Mrs. I.N. Phelps-Stokes, 1897, oil on canvas, 214 x 101 cm, Metropolitan Museum of Art, Manhattan. His best portrait work is considered to be the series of portraits that he was commissioned to paint for the family of wealthy art dealer Asher Wertheimer, the largest commission from a single patron (1898-1902). In this series Sargent captures family members, young and old in natural and unaffected poses. The portrait Almina, Daughter of Asher Wertheimer (1908), shows Singer's love for the exotic; in it the daughter is wearing a Persian costume, a pearl encrusted turban, and is strumming an Indian sarod. Wertheimer bequeathed most of the paintings to the National Gallery in London. A turning point in Sargent's career came after his move to London and a subsequent exhibition with the Royal Academy in 1887. Britains fell in love with his painting Carnation, Lily, Lily, Rose, which shows two young girls lighting lanterns in an English garden bathed in a lovely natural light. The work which reflects both impressionistic influence and Japanese technique was purchased by the Tate Gallery in London. In 1894 Sargent was elected an associate of the Royal Academy, and was made a full member three years later. In the 1890s he averaged fourteen portrait commissions per year, among them the striking yet feminine Lady Agnew of Lochnaw(1892) Its exhibition at the Royal Academy in 1898 secured Sargent's reputation as one of the finest portrait artists of the era. In 1925, soon before he died, Sargent painted his last oil portrait, a canvas of Grace Curzon, Marchioness Curzon of Kedleston. The painting was purchased in 1936 by the Currier Museum of Art, in Manchester, New Hampshire, where it is currently on display. El Jaleo, 1880, oil on canvas, 240 x 348 cm, Isabella Stewart Gardner Museum, Boston. After 1910 Sargent abandoned portrait painting and focused on landscapes and murals; he also took up sculpting. However, as a concession to the demand for portraits by his wealthy patrons, he continued to dash off rapid charcoal portrait sketches for them, which he called "Mugs." Forty-six of these, spanning the years 1890-1916, were exhibited at the Royal Society of Portrait Painters in 1916. His famous mural The Triumph of Religion is still displayed at the Boston Public Library. Discussion about the mural began in 1890 and in 1893 he had an official contract. For this commission Sargent made numerous visits to the United States in the last decade of his life including a stay of two full years from 1915-1917. The 16-panel pictorial narrative is a series of oils with the theme The Triumph of Religion. They were attached to the walls of the library by means of marouflage. The multimedia mural also employs more than 600 relief elements as well as sculpture. Sargent’s Triumph of Religion illustrates one version of an Enlightenment idea: that Western civilization’s progress into modernity would mean radical changes in the fortunes of religion. Many predicted that religion would disappear, replaced by a scientific “disenchantment” of the universe. Sargent, and the experts he consulted, believed that the external forms of religion (creeds, dogma, institutions) would decline and pass away, while religion itself would survive and even triumph through private, individual, subjective spiritualities. Sargent Hall came to be known as an American Sistine Chapel with the object of “worship” being not the Christian deity but the informed and enlightened subjectivity of education. Triumph of Religion narrates a story that goes from materialist superstition in Pagan Gods, through ancient dogma to a “modern” spirituality of the heart. Sargent himself supervised the installation of Frieze of Prophets, completed by late April 1895. Art critics hailed his work as an “epoch-making achievement,” and it led to a second contract that doubled his compensation while expanding the scope of his commission. Frieze of Prophets has been the most sought-after reproduction from the mural cycle and has been displayed in various renditions on church bulletins, book illustrations, ecclesiastical stained glass, and wall decorations. 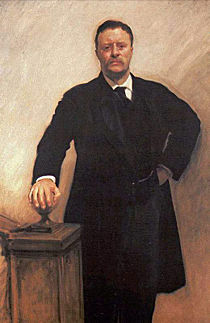 Sargent traveled to Boston to oversee the installation of the Dogma of the Redemption on the south wall in January 1903. This piece included a version of the Crucifix, which was an original sculpture by Sargent. Thirteen years would pass before Sargent sent another portion of his murals to Boston. Sargent’s final mural installation, consisting of the Synagogue and Church paintings on the east wall, took place in October 1919. After this installation a controversy brewed in which his metaphoric depiction of a synagogue that showed a broken, blindfolded figure—was criticized as anti-Semitic. As a result the Massachusetts legislature considered passing a bill to have it removed from the library. The reaction to this one panel stunned Sargent to the extent that he eventually backed off from the mural project and he died before completing its final panel. The final panel was to have been the mural’s keynote painting, tying the entire project together: a rendering of Christ’s Sermon on the Mount that was to appear between Synagogue and Church. The panel remains empty to this day. In the fall of 1920, Harvard University commissioned Sargent to produce two paintings for the main stairwell at Widener Library as part of the University’s enduring tribute to its World War I dead. In 1922 his Coming of the Americans went on display in the Widener Library. The Widener murals occupy arched panels over fourteen feet high at the top of the stairs. The two panels are titled Entering the War and Death and Victory. Among the artists with whom Sargent associated were Dennis Miller Bunker, Edwin Austin Abbey (who also worked on the Boston Public Library murals), Francis David Millet, and Claude Monet, whom Sargent painted. 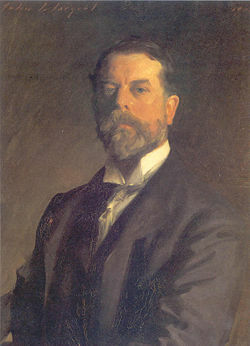 Although Sargent is usually not thought of as an Impressionist painter, he sometimes used impressionistic techniques to great effect. His Claude Monet Painting at the Edge of a Wood is a rendering of his good friend completed in his own version of the impressionist style. Sargent developed a life-long friendship with fellow painter Paul César Helleu, whom he met in Paris in 1878 when Sargent was 22 and Helleu was 18. Sargent painted both Helleu and his wife Alice on several occasions; the most memorable one being the impressionistic Paul Helleu Sketching with his Wife, done in 1889. His supporters included Henry James, and Isabella Stewart Gardner (who commissioned and purchased works from Sargent, and sought his advice on other acquisitions), and King Edward VII, whose recommendation for knighthood the artist declined. John Singer Sargent died on April 15, 1925 and is interred in Brookwood Cemetery near Woking, Surrey, England. His critics referred to him as a relic of the Gilded Age and out of step with the artistic sentiments of post-World War I Europe. Foremost of Sargent's detractors was the influential English art critic Roger Fry, of the Bloomsbury Group, who at the 1926 Sargent retrospective in London dismissed Sargent's work as lacking aesthetic quality. Despite a long period of critical disfavor, Sargent's popularity has increased steadily since the 1960s, and his works have been the subject of recent large-scale exhibitions in major museums, including a retrospective exhibition at the Whitney Museum of American Art in 1986, and a 1999 "blockbuster" traveling show that exhibited at the Museum of Fine Arts, Boston, the National Gallery of Art Washington, and the National Gallery, London. In December 2004, Group with Parasols (A Siesta) (1905) sold for $US 23.5 million, nearly double the Sotheby's estimate of $12 million. The previous highest price for a Sargent painting was $US 11 million for his Cashmere painting in 1996. ↑ Portrait of Robert Louis Stevenson and his Wife John Singer Sargent Virtual Gallery, "Robert Lewis Stevenson and his Wife"
↑ John Singer Sargent Virtual Gallery, "Royal Society of Portrait Painters"
↑ The Sargent Murals at the Boston Public Library Sargentmurals.bpl.org. Retrieved August 21, 2007. ↑ Description and Interpretation Sargentmurals.bpl.org. Retrieved August 21, 2007. ↑ Elaine Kilmurray, "Traveling Companions," in Adelson, Warren. 1997. Sargent Abroad: Figures and Landscapes. (New York: Abbeville Press), 57-58 ISBN 0789203847. ↑ Kilmurray, "Chronology of Travels," (1997), 240. ↑ 'Wonderful indeed, but most wonderful that this wonderful performance should ever have been confused with that of an artist.' Richard Thomson, and Elizabeth Prettejohn. 1998. John Singer Sargent - (Tate Gallery) - "Interpreting Sargent." TLS, the Times Literary Supplement. (4988):3, 73. ↑ Stevenson portrait sold for £5m, 20 May, 2004, BBc.co.uk. Retrieved August 21, 2007. ↑ Sargent painting sells for $23m,3 December, 2004. BBC.co.uk. Retrieved August 21, 2007. Great Expectations: John Singer Sargent Painting Children tfaoi.com. History of "John Singer Sargent"
This page was last modified on 22 May 2018, at 15:06.